I know I’m not the only person who lives in a rainy city and would rather get soaked than wear a bright yellow rain jacket and mud boots or one of those weird plastic poncho things that they sell on street corners to tourists in NYC, but finding stylish rain gear is pretty much impossible. That said, I hate, hate, hate the rain to the point where it’s almost pathological; sometimes I even refuse to leave the house if it’s raining to hard. 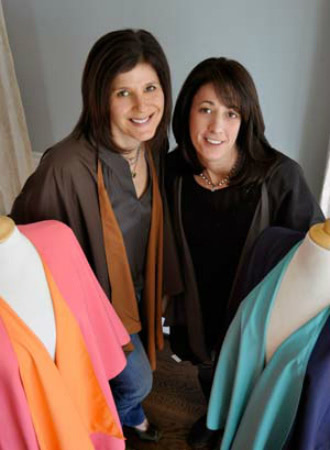 Stacy Struminger and Rachel Teyssier are best friends who found themselves up against this exact problem and decided to do something about it. 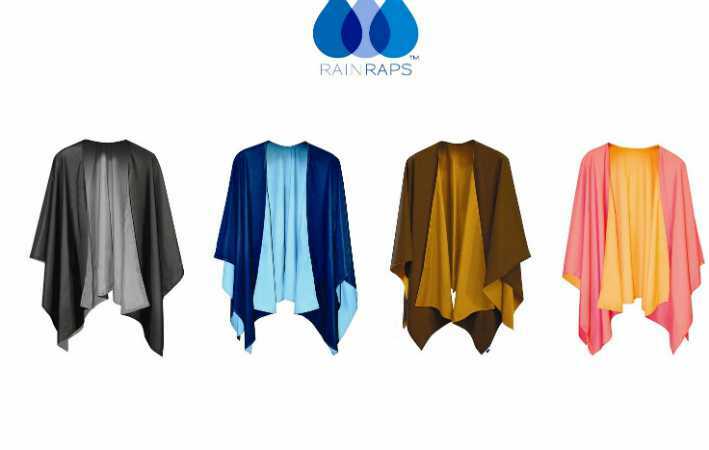 The result was RAINRAPS, an online apparel company that creates raincoats in a totally sleek design and in a variety of colors. If you feel more like blending in with the grey around you, they’ve got a wrap for that but if you’re like me and think that rainy days call for bright colors, check out their pink and orange option. Rachel took some time away from her busy life as a full time mom and full time startup co-founder to explain how she got where she is today and what the future holds for waterproof clothing. I was speaking with my mother, explaining the concept of the RAINRAP and she said immediately “You need to call it a RAINRAP.” I loved it from the first second I heard it! Thanks, Mom! Check our overnight orders and prepare our shipments for the day. Call my partner/best friend to discuss the days “to do” list while walking my dog, Charlie. We have started with two and we are making it work with two. Of course, we have hired some amazing contractors to help us along the way! I have to say that I am not one to get frustrated in my professional world…now my family…that’s another story and you probably don’t need to hear those details. Being that it is just the two of us, most of our time together is over the phone and via email. The shipping department definitely has music on at all times! I would say we save the bumpin’ music for the end of the day, the soothing music of Adele Radio keeps me focused. We are looking to grow our company with more retailers carrying RAINRAPS and an assortment of RAINRAP styles. We feel that RAINRAPS can be a whole new category in woman’s accessories! You know, Kleenex is to tissues as RAINRAPS will be to waterproof rain wraps! Music to my ears! Who or what inspires YOU? Role models? Quotes? Running? Video games? Snack food? Give us the deets, lady! Anyone in life who is passionate about what they do inspires me. Whether it be their exercise regimen, their hobbies, their jobs, I love a person who is passionate and living life to their fullest! We were lucky enough to have our husbands fund us. Find your passion and don’t be afraid to go for it! Travel the world with my husband and two kids. I am assuming he has off, too! I don’t know that I would go as far as calling myself a successful entrepreneur right now, but I am pleased at where we have come in such a short time. We have so much more to accomplish and so many new ideas that I hope we will continue to strive for more. That is what keeps us going! Website you couldn’t live without and why?/Mobile App you’re in love with and why? Common Sense Media – it allows me to check on movies, online games, etc… to make sure they are age appropriate for my children. One adorable dog named Charlie. Photos: Courtesy of the founders and RAINRAPS.